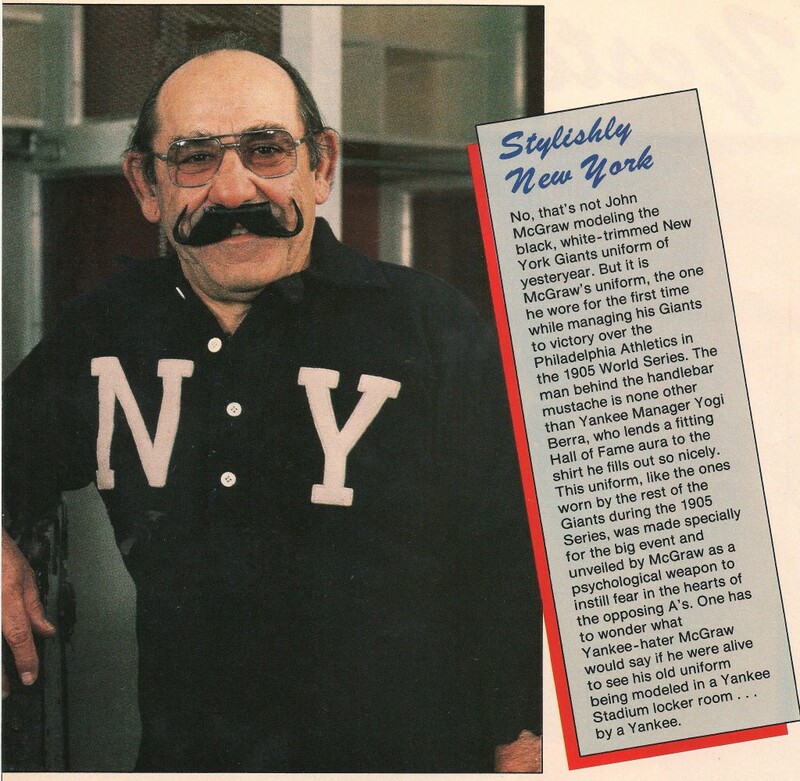 When Yogi Berra suited up in John J. McGraw’s alleged 1905 World Series jersey for a 1985 Sporting News photo shoot in the Yankee locker room, he was still manager of George Steinbrenner’s ballclub. Writer Bill Madden remembers it as a memorable photograph in his 2010 biography, Steinbrenner: The Last Lion of Baseball, because, “it proved to be the last time Berra would have much interaction with Steinbrenner…” Sixteen games into the 1985 season The Yankee owner fired Yogi and replaced him with Billy Martin. In memorabilia circles, however, the 1985 Sporting News photograph is now infamous for reasons other than Yogi’s firing by George. Madden also recalls, in his Steinbrenner biography, that Yogi and his players “donned period handlebar mustaches while wearing authentic uniforms of legendary, long ago Hall of Famers Ty Cobb, Cy Young, John McGraw and Pud Galvin.” But it just wasn’t so. In typical Halper fashion, the collector told Madden an incredible aquisition story for the 1985 Sporting News article about his uniform collection. 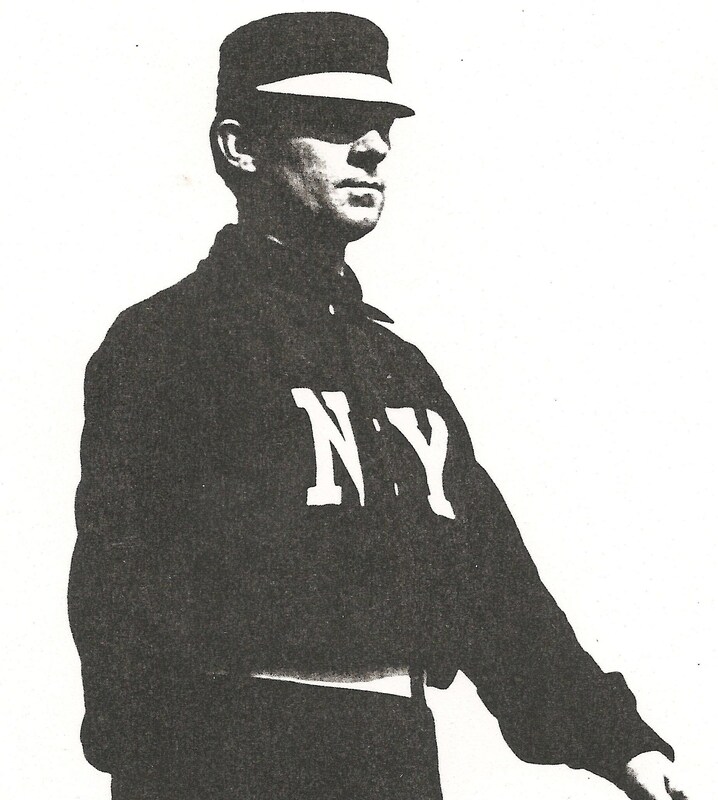 Madden wrote, “Another example of Halper’s determined detective work was his aquisition of the uniform worn by Hall of Famer John McGraw in the 1905 World Series….The uniform, made of heavy wool like all the uniforms of that era, is black with a white lettered ‘NY’ on the front.” Halper told Madden, “In my readings of Giants history, I recalled how McGraw had been especially close to a black fellow named Macklin who he hired as the Giants’ (assistant) trainer…I traced Macklin’s relatives to Manitoba in Canada. I had been told by this contact that they might have the McGraw uniform, and darned if he wasn’t right.” Quite a detailed account coming from Halper, the Yankee limited partner and world-famous collector, and another extraodinary acquisition story that was never questioned. The tale rolled right off his tongue like the acquisition stories for his 1919 “Shoeless Joe” Jackson jersey and his 1914 Babe Ruth rookie jersey, which also went unquestioned. In the course of examining Halper’s alleged 1905 New York Giants jersey, we found examples of these uniforms in period photographs that served as the basis for Mark Okkonen’s study of the garments worn by McGraw’s club in 1905 (and 1906). Okkonen’s examples appear in his book , Baseball Uniforms of the 20th Century, and on the Baseball Hall of Fame’s “Dressed to the Nines” online uniform database. Mark Okkonen's research provides graphics for the Hall of Fame's "Dressed to the Nines" online uniform database. This illustration features the uniforms worn by the New York Giants in 1905. In 1999, Halper included the same alleged 1905 McGraw jersey worn by Yogi as Lot 363 in Sotheby’s Halper Auction. Sotheby’s offered the jersey as a ”1905 John McGraw Giants Player/Manager Jersey.” Sotheby’s further described the garment as a “navy blue flannel collared pullover jersey (with) a four-button front…”McGraw” is stitched on the back left tail…The shirt dates from the days of McGraw’s great early Giants teams.” Nowhere in the description did Sotheby’s mention Halper’s claim that he purchased the jersey from the family of “black fellow named Macklin,” who Halper said was McGraw’s assistant trainer. Unfortunately, for the winning bidder of Halper’s alleged 1905 treasure, the truth regarding this McGraw jersey was in Cooperstown all along. An examination of Halper’s jersey (and the Sotheby’s catalogue description) reveals that his garment was colored “navy blue,” not black. (No manufacturers tag was noted by Sotheby’s) Additionally, compared to the Hall of Fame’s authentic Wiltse jersey, the “N. Y.” insignia sewn onto the chest area of Halper’s jersey shows contrasting letter alignment and construction. The most damning characteristic, however, is that the letters sewn onto the alleged McGraw jersey are the wrong size. They are not even close, as evidenced in a side-by-side comparison. (Left) Hooks Wiltse's authentic 1905 NY Giant jersey from the collection of the Baseball Hall of Fame exhibits the proper color and sizing for the "NY" logo. 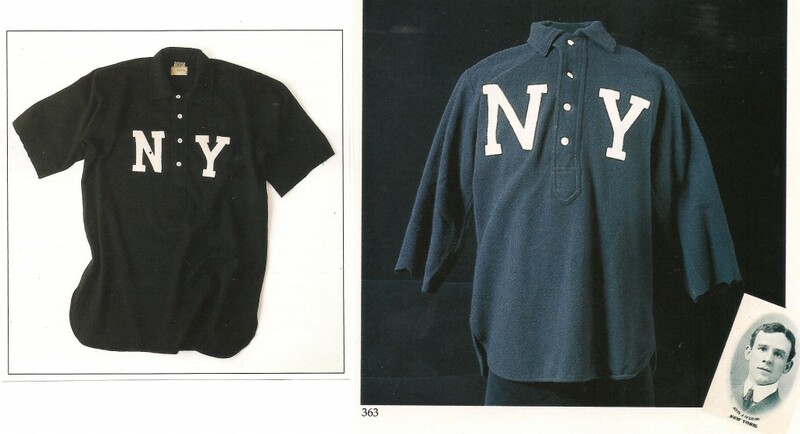 (Right) Barry Halper's bogus 1905 McGraw jersey sold at Sotheby's in 1999, but is the wrong color and features an "NY" emblem that greatly contrasts the authentic HOF exemple from Wiltse. In addition, the files at the National Baseball Library in Cooperstown include at least one photograph of John J. McGraw wearing his actual 1905 black jersey. The photo shows that McGraw’s jersey matches Wiltse’s exactly in relation to letter placement and sizing. Halper’s jersey, again, stands in stark contrast. This photo from the National Baseball Library shows McGraw in his authentic 1905 Giants World Series jersey. The "NY" emblem matches the sizing on the HOF's authentic 1905 jersey of "Hooks" Wiltse. So where do buyers of bogus items from the Halper sale stand today, twelve years later? According to Marsha Malinowski, Sotheby’s Manuscript specialist and the coordinator of the Halper Auction, their prospects don’t look good. Said Malinowski, ”Our materials that we sell at auction are guaranteed for five years after the sale, and if there are any issues, we ask that they are brought to the floor before the five year authenticity (guarantee).” So, it appears buyers of Halper’s bogus uniforms, including those of Hall of Famers Wilbert Robinson, Hughie Jennings, Jimmy Collins and Reggie Jackson (just to name a few) are out of luck. Bill Madden alleges that Halper's Giant jersey, modeled by Yogi, was worn by John McGraw in the 1905 World Series. Madden also recounts the story of McGraw ordering the Giant uniforms for the 1905 Series. Hooks Wiltse appears in his authentic 1905 Giant World Series uniform at a 1944 old-timers event. The Sporting News photo (Courtesy of JohnRogersArchive.com) is dated June 29, 1944 and indicated Roger Bresnahan is to Wiltse's right and "Moose" McCormick to his left. 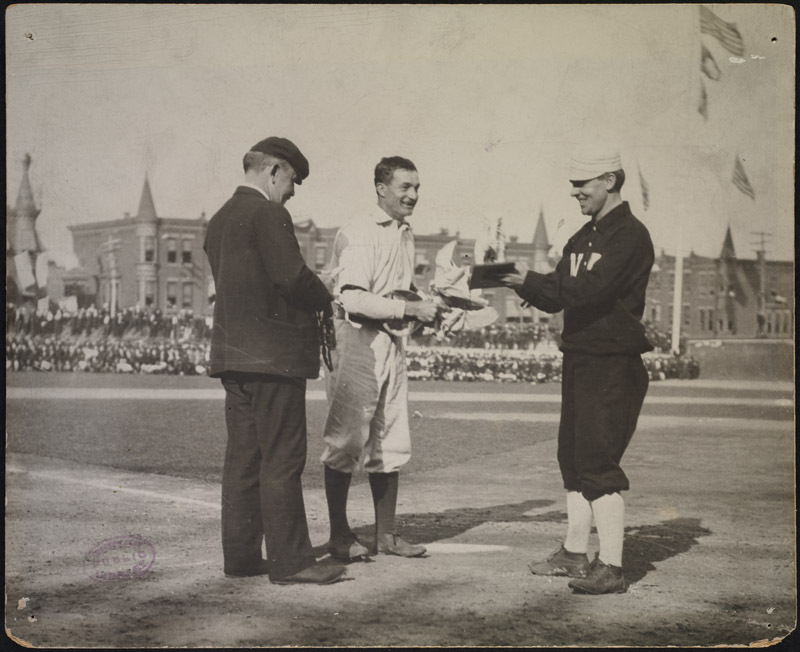 And here’s one we forgot, but was brought to our attention by reader “jere”: From the Boston Public Library’s “McGreevey Collection,” its a photograph of McGraw making a presentation to Lave Cross at home plate of the Columbia Street Grounds, Philadelphia, during the World Series of 1905. McGraw is wearing his black uniform made specially for the Series. The plot just gets thicker with every report comming out about the Halper so called 40 mil. dollar collection.At the rate these bogus items are showing up from his collection,it will be lucky to end up being worth the $ that the paper cost,or the material it cost to make the item in qustion.The shame of it all , the people who spent all that $ for the item,can now put it on the floor for the cat,cause thats all it is good for and just think how many people he duped into thinking he had the world and was the best person on earth !!!! I am wondering who made these uniforms for Halper. Great article. I wonder what % of Halper’s jerseys were real. Yet another fake from the Halper Collection. This is but the tip of the proverbial iceberg. Marlon asked what percentage of Halper’s jerseys were real? I don’t think they are all fake, but it may be a safe guess to estimate that less than half of the collection is legitimate. If I were to hazard a guess, I’d say about 20% may be authentic. What a waste…What a crook! Halper also had rare jerseys of Cap Anson, Ed Delahanty, Iron Man McGinnity, Buck Ewing, Jim Thorpe wonder about those? And didn’t he claim to have every HOFer jersey? Where did all the one’s end up that weren’t sold by Sotheby’s? The Hall of Fame or elsewhere? This blog is awesome. I hope you continue to do this work. I wonder if Halper knew … was he scammed or were we? He wasn’t a rookie in the field and there are other baseball “memorabilia” stories not relating to jerseys that prove he wasn’t kosher. Halpers name was like “GOD ” in the circles of memorabilia and evryone thought he was the best thing since sliced bread.If he were around today and seeing how the true Barry Halper was being torn apart for his forged, stolen, etc. items,he would probably go hide in a cave somewhere for the fear of being captured by the people he duped, just like Bin Laden is doing,so as to not be caught.I think of the thousands, maybe millions that were spent on nickle and dime garbage. By the way, if I was Yogi,I would be pissed,knowing that I had a garment on me that was fake and probably came from some bargain basement store. Poor Yogi! Wonder whose stuff Steinbrenner was wearing?? Probably something Halper got out of a Good Will store and claimed it was once owned by some famous person. I’m also a little confused about the inconsistency in terms of short/long sleeves. Thanks for sharing those photos. The first one from BPL is from the 1905 World Series, but the other two from SI are not. The one picturing McGraw and Mack is from the 1911 World Series and the one of Mathewson is from the regular season of 1907. 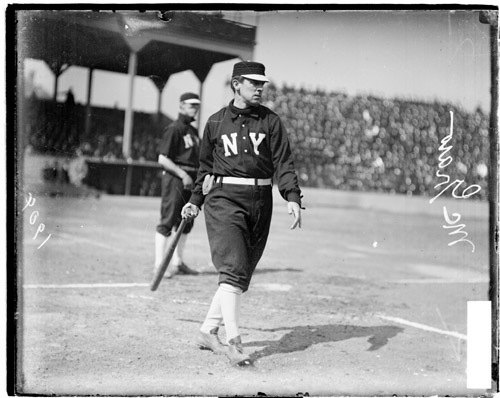 Mathewson is wearing a “collar-less” jersey featuring the “NY” emblem, which was only worn during that season. As far as the sleeves, we’ve seen many early examples which had the availability (by buttons) to add sleeve extensions. We’ve also seen some pitchers cut their sleeves to lengths that were more condusive to their personal preference. 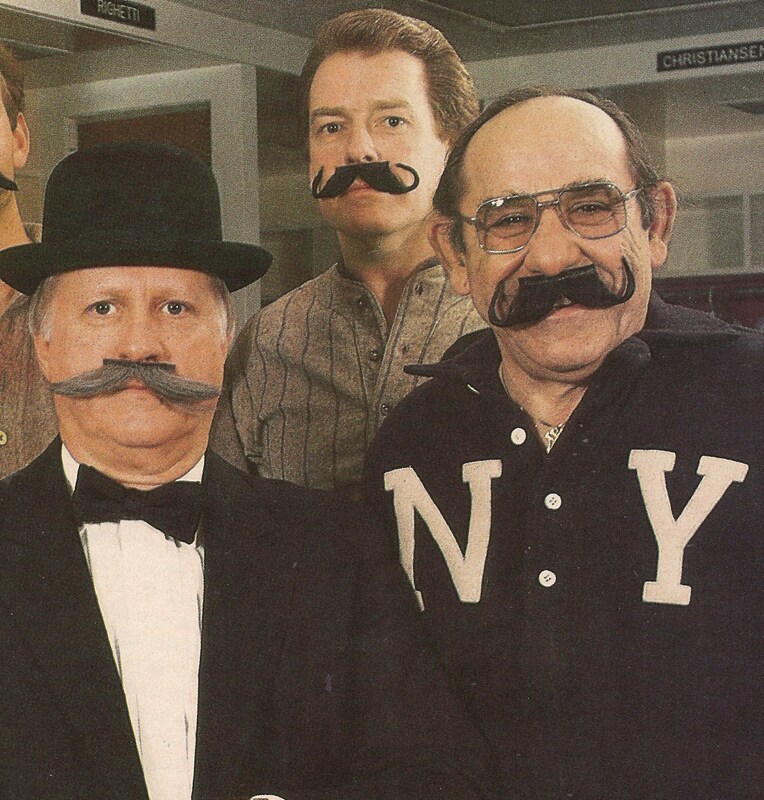 Just as fake as those mustaches. I know this is nitpicking, but the handlebars were out of style by 1890s (though “old-timers” like Anson, Brouthers and Galvin kept theirs anyway). It would be as if someone in 2085 tried to look like someone from 2005, while wearing shoulder length hair, beards and bell-bottoms. I always thought those photos were so dumb, but never knew what the “real” fakes were. The McGraw photo from post #14’s 2nd link clearly shows McGraw wearing a different jersey than the long-sleeve ones he is shown wearing in other photos – not as short-sleeved as Wiltse’s, but short. Hard to imagine they created two different short-sleeve shirts for the series, along with a long-sleeve version. 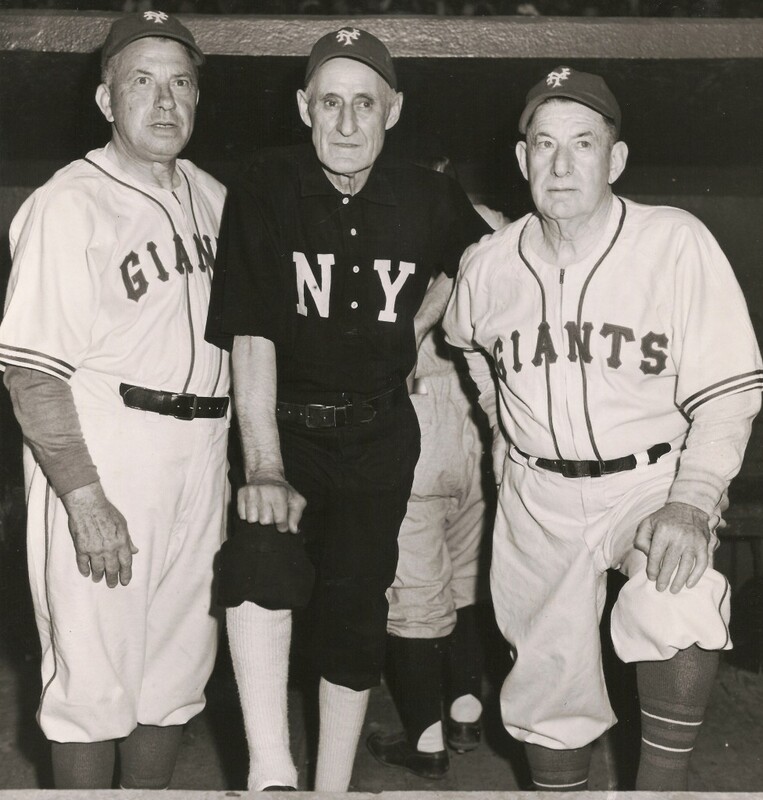 The 1944 photo shows Wiltse wearing the same jersey that’s in the HOF – is it possible that, 39 years after the series, Wiltse is wearing a repro jersey that he had made for the old-timers game, and that that’s the one in the HOF? And perhaps the Halper one, featuring sleeve lengths much closer to the short-sleeve McGraw pic than does the Wiltse jersey, is actually a real jersey? There’s still the color issue, but just saying. The uniforms from that period were custom made for each player and had different sleeve lenghts as well as sleeve extensions to create a longer sleeve (attached by buttons inside the sleeve. The bigger problem is with the size of the “NY” insignia on the chest. Wiltse’s jersey worn in 1944 was the same Spalding uniform worn in the 1905 WS.